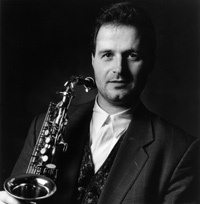 George ROBERT is the youngest Swiss jazz musician to have had an international career in jazz. He has performed and recorded with many of the jazz giants, performs all over the world and is in great demand as a saxophonist, clarinettist, composer, arranger and educator. His biography appears in the Jazz Encyclopedia authored by Leonard Feather & Ira Gitler. George ROBERT was born on September 15, 1960 in Chambesy (Geneva), Switzerland. He started playing piano at a very early age and then clarinet at age 10. He studied classical and jazz clarinet with Luc Hoffmann at the Conservatoire Populaire de Musique in Geneva and in 1980 he left for Boston, to study with the world-renowned woodwind instructor, the late Joseph Viola. He earned a Bachelor of Music Degree in Jazz Composition & Arranging in 1984 and then received a full scholarship to study at the Manhattan School of Music where he earned a Master of Music Degree in Jazz Performance in 1987. George remained in New York City and started working with Tom Harrell in 1987, forming a quintet which became one of the most acclaimed bands in modern jazz, recording 5 albums (1987 – 1992) and giving over 125 concerts worldwide during that period. The band featured Dado Moroni, Reggie Johnson & Bill Goodwin. While in NYC George worked with many of the top names in jazz: Lionel Hampton, Clark Terry, Phil Woods, Billy Higgins, Ray Brown, Billy Hart, Joe Lovano, Buster Williams, Ray Drummond, Peter Washington, Louis Hayes, Hank Jones, Arturo Sandoval, Claudio Roditi, Bud Shank, Bobby Durham, Jay Anderson, Benny Green, Alan Dawson, Jeff Hamilton, Ron McClure, Toshiko Akiyoshi, Lew Tabackin, etc. Since 1983 George has been leading several small bands, including a quartet featuring Dado Moroni, Isla Eckinger & Peter Schmidlin. This group completed a 16-week world tour in 1991 and featured Clark Terry as special guest during a 4-week North American Tour. The collaboration with Clark Terry has grown ever since, leading to many more concert tours and 4 recordings. As a leader George performed at the most important jazz festivals including: Montreux (at age 23), Montreal, Verbier, Vienne, Amsterdam, Lugano, Geneva, Berne, St-Gallen, Lucerne, Cancun, Vancouver, Toronto, Edmonton, Calgary, Victoria, Saskatoon, Samois-sur-Seine, and many others on both continents. He has appeared at the most renowned jazz clubs around the world: Blue Note, Birdland, Village Vanguard, Visiones (NYC), Blues Alley, One Step Down (Washington DC), The Jazz Showcase (Chicago), Catalina’s (Los Angeles), Kimball’s (San Francisco), Kuumbwa (Santa Cruz), Half Moon Bay, New Morning, Sunside Radio France (Paris), Moods, Widder Bar (Zurich), Mariann’s (Berne), Capolinea (Milano), and many more all over the world. From 1990 to 1994 he lived in Vancouver, Canada and performed extensively on the West Coast, with Oliver Gannon, Larry Fuller, George Ursan, Russ Botten, etc. In 1995 he moved back to Europe and was nominated Director of the Swiss Jazz School in Berne, the oldest independent jazz school in Europe and a member of the Hochschule der Künste in Berne. In 1998 he played lead alto in the Phil Woods Big Band which performed at the major jazz festivals in Europe for 3 weeks: North Sea, Vienne, Molde, Wigan, Estoril, Torino, La Spezia, Perugia, Pescara, etc. He also started working with Kenny Barron with whom he has just recorded a 3rd album.